The South Korean flag, called taegukgi in Korean, was adopted on January 25th 1950, following the forming of the Republic of Korea in 1948. 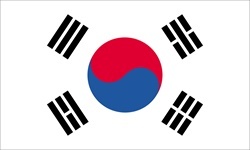 However the original version of the flag was designed in 1882 by the Korean ambassador to Japan. The white background represents the purity of the people. The red and blue circle in the middle form the Yin Yang that represent Heaven and Earth in perfect harmony. They compliment each other by being perfect opposites, such as, light and dark, day and night.